You fancy a mini getaway or cheap weekend breaks? Thanks to a well established and dense network of bus routes, trains and flights, you can easily reach every corner of Europe and there’s a lot on offer – even aside from popular tourist destinations such as Paris, London or Amsterdam. Allow us to provide you with unique and affordable ideas for your next city break! Where to make the most out of your holiday budget? £360 will last you longer than you think – if you know to spend your holiday money right. For our city breaks ranking, we calculated how much money an average day of holiday will cost you in each of Europe’s capitals. As a next step, we looked into how many days you can spend in each city with a budget of £360. The top city trip destination (moneywise) turned out to be Kiev, where you can spend a total of eight days. If you’ve never been there, you’ll be surprised. Not only does Ukraine’s capital city offer monumental churches and numerous interesting museums but it’s also the perfect destination for bathing beauties and sun lovers: the Dnieper River, which flows towards the Black Sea, connects several lakes and branches out in Kiev’s city centre. This results in numerous fascinating little islands with appealing sandy beaches. Place number two is taken by the Macedonian capital city Skopje, where you’ll have seven days to study the contrasts of modern architecture and Byzantine history. Almost equally affordable is Bucharest – a city that certainly lives up to its nickname Little Paris. If you opt for a trip to the Hungarian capital city, you’ll have six days to fill with sightseeing, relaxation and fun activities. Europe’s most expensive capital – still worth a visit? If you only have one day to spend on a short getaway, you can invest your £360 in a trip to Copenhagen or Reykjavík. Food, drinks and the hotel in particular will cost you quite a bit of money in these two cities. Nevertheless, we’d highly recommend a trip to the Danish capital city of Copenhagen, a.k.a. the most expensive city in Europe. Charming colourful houses close to the port, countless museums, historic palaces, modern edifices as well as the freetown Christiania – a non-mainstream artists’ settlement – create a very unique and special atmosphere. Reykjavík, the capital city of Iceland – this mysterious volcanic island to the south of the polar circle – knows how to attract and satisfy tourists despite the price tag that comes with a stay there. Get immersed in a fairytale land, in which everything seems to be out of this world and discover the natural monuments and landmarks right outside the city gates. It won’t come as a surprise that London is not among the cheapest of holiday destinations. 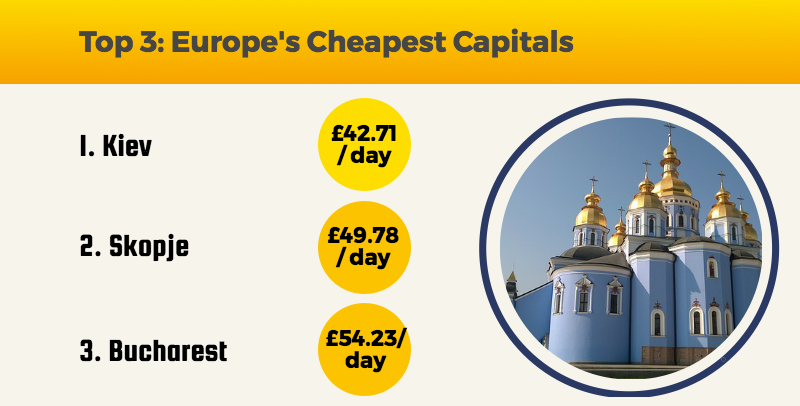 An average day in the UK’s capital city will cost you about £156.08, which is more than three times as much as what you’d have to pay in Kiev. However, when compared to the capital cities of the UK’s neighbouring or closeby countries, London can still be considered a true travel bargain: an average day in Reykjavík, Dublin, Amsterdam and Paris is still more expensive than a day in London. One of the reasons consists in London’s many free sights: while a visit of the Louvre or Amsterdam’s Rijksmuseum will burn up a rather large chunk of your holiday funds, London’s most famous sights and attractions – including the British Museum, the Tate Modern and the V&A – can be visited free of charge. Taking a look at our heatmap, you’ll instantly see the price differences for European city breaks, measured by the level of prices in the respective capitals. The lighter the shade, the cheaper it is to go there for holidays. As you can see, Eastern Europe in particular is the perfect destination for an affordable getaway. Where will you have to pay most for a mini break and which destination is a real travel bargain? 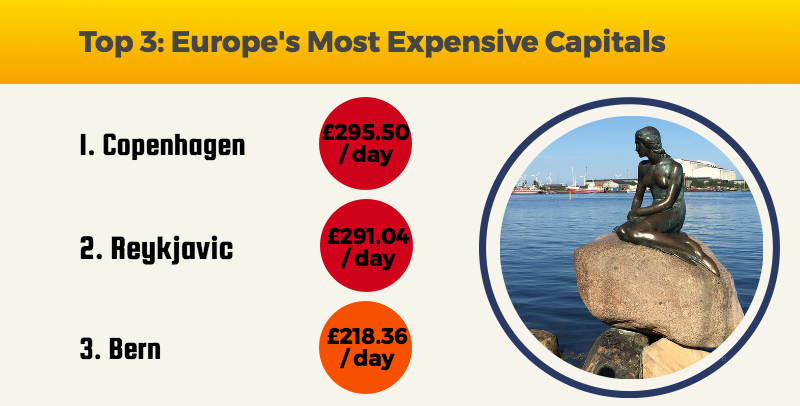 We took a look at all of Europe’s capitals* to find out, where a single day of holiday is cheapest and where it’s most expensive. A day in Copenhagen, for instance, will cost you about seven times as much as a day in Kiev. In addition, we calculated how many days you can spend in each city with a budget of £360. For our city breaks price comparison, we looked at data for 45 European capitals in June 2017. The average price per day is made up as follows: one night for two in a 3-star hotel, hotel breakfast buffet, two single bus fares, one normal sized meal at McDonalds, one main course in an affordable restaurant, two pints of beer, one small cappuccino, the entrance fee for the city’s top two sights or attractions according to Tripadvisor. Some of the sights were free of charge. Data was not fully available for the cities Città di San Marino (San Marino), Monaco (Monaco), Nicosia (Cyprus) and Vaduz (Liechtenstein), which is why these were excluded from the final ranking.